Iranian military forces possess a wide variety of artillery rockets, although the diversity of these holdings is exceeded only by the paucity of detailed information in the open literature. Iran produces a range of artillery rocket systems, including the Shahin, Oghab, Fajr, Naze'at, and Zelzal. 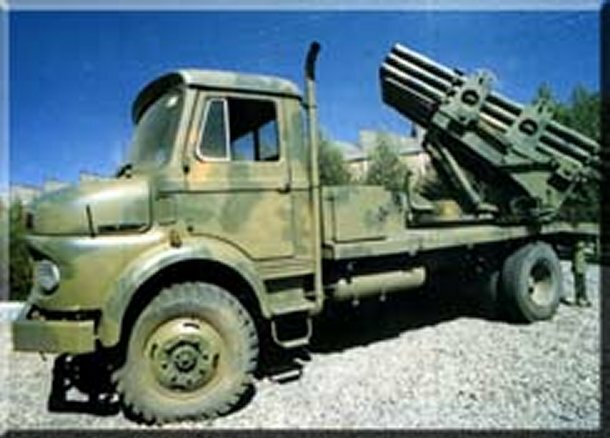 Although these rocket systems were developed primarily for a battlefield support role, Iran used the Oghab in a strategic role during the February-April 1988 "War of the Cities," to bombard Iraqi cities and towns Although details on most of these systems is spare, it is reported that the Oghab, a 230 mm artillery rocket with range of 34 km, is launched from a launcher with three launch tubes. The Nazeat-10, an extended-range version of the Nazeat-6 FROG-derivative, is fired from the same launcher as the Oghab, but can also be fired from L2 and L3 FROG launchers. Iranian manufactured rockets launchers include the Haseb, an Iranian 12 tube 107 mm MRL that is a variant of a Chinese 107 mm rocket, as well as variants of Chinese and Russian 122 mm rockets such as the Noor and Hadid 40 tube 122 mm MRL systems and the Arash version of the 122mm Katyusha MRL. The "Thirty- Bomb Rocket Truck" is designed and manufactured for quick and exact firing operations in any Geographical Conditions and for destroying Anti-Fire barriers and enemy�s motorized armored devices with higher mobility. It should be noted that this weapon is mounted on Benz LA911. It is of high value because of its quick transposition and crossing through road and off-road. Minimum launching angle 11 Deg.